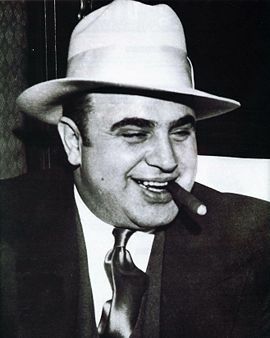 Alphonse Gabriel "Al" Capone was an American gangster who led a Prohibition-era crime syndicate, known then as the "Capones," dedicated to smuggling and bootlegging liquor and dedicated to other illegal activities, in Chicago, from the early 1920s to 1931, when he was sentenced to federal prison, including a stay at the infamous Alcatraz federal prison, for tax evasion. His business card reportedly described him as a used-furniture dealer. Don't get the idea that I'm knocking the American system.